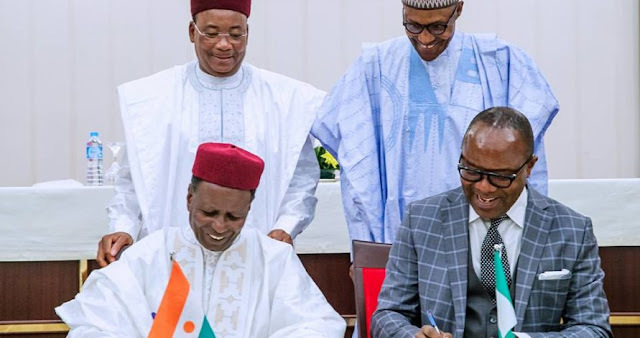 South-South Governors, PANDEF Hold Emergency Meeting Over $2 Billion Katsina Refinery, Back Out Of Ceasefire Agreement In N/Delta, Call Buhari "President Of The North". Six governors of South-South and Niger Delta leaders under the aegis of Pan Niger Delta Forum (PANDEF) just came out of an emergency meeting held in Asaba, Delta State over the plan to site a $2 billion refinery in Katsina, an idea they described as highly provocative and cheating to the Niger Delta region. In a communique read by the governor of Akwa Ibom state, Emmanuel Udom, governors and leaders of Niger Delta accused president Muhammadu Buhari of implementing northern agenda to the detriment of other parts of the country, especially Niger Delta. They said Buhari quickly pushed for the establishment of North East Development Commission to rebuild North-East that was destroyed by disgruntled terrorists from the same region for no reason, but he chose to play politics with the cleaning of Ogoni that was degraded by Shell for the enrichment of the federal government. They said Buhari's government has wasted billions of dollars from Niger Delta oil and gas resources on the search for oil in the north while neglecting the Gas City project started by Goodluck Jonathan in Delta State. They also accused Buhari of leaving seaports in Niger Delta in a state of comatose, but he has invested billions of dollars in the completion of Baro inland water port in the north to be commissioned in August. According to the communique, the idea of building a refinery in Katsina State is not acceptable to the people of Niger Delta because there are several better places to site such monumental project in the region where the oil is being produced. They expressed concern that it is a son of the region who crippled the most viable state in the region just to sponsor a man that is now marginalizing the region. South-South governors and PANDEF leaders unequivocally backed out of the ceasefire agreement between Avengers and FG that they were instrumental to, they said Buhari should be held responsible if hostility and attacks on oil facilities resume in Niger Delta because he has shown clearly that he is an enemy of the region. They ended the communique by calling Buhari president of the North who asked the World Bank to focus only on the North. This communique was actually formulated and issued by myself because I can't believe that leaders of my region have still not reacted strongly to the $2 billion Katsina refinery plan, this is really sickening. Copyright © 2016-2017. Biafra Today All Rights Reserved.